I don't know when we stopped calling it MGM--but apparently everyone calls it Hollywood Studios now. It confused me. Well, the most popular ride in ANY of the parks is at Hollywood Studios--a Toy Story arcade style game where you shoot a gun and play 5 or 6 different games from your little car. It really was amazing. I don't have any pictures of it. But the main theme of our day was meeting characters. 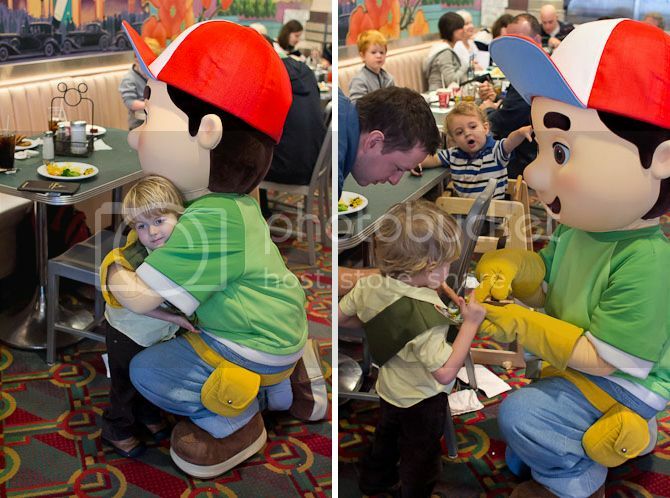 We sprung for a fancy lunch where four different Disney Jr. characters come over to your table for pictures--and it was amazing and worth every penny (and not just because it's the only place with bottomless Diet Cokes). 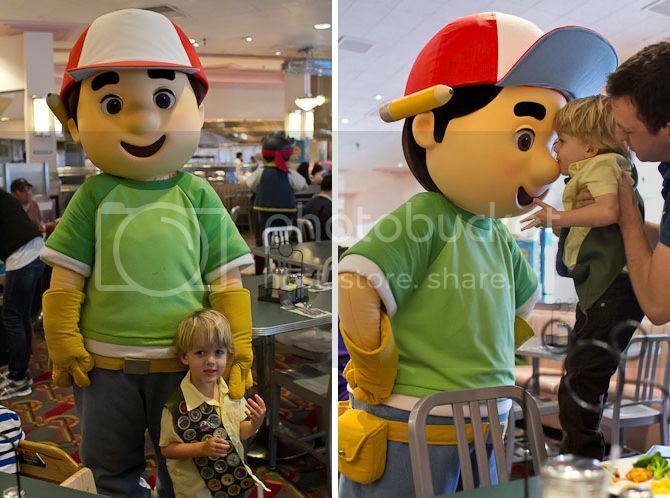 I mean, Sol and I are HUGE fans of Handy Manny! JK. Finley and Braden are huge fans. Meeting these characters is funny because they don't talk--and they are all likely played by tiny women since they are all pretty much shorter than me with their giant heads on. 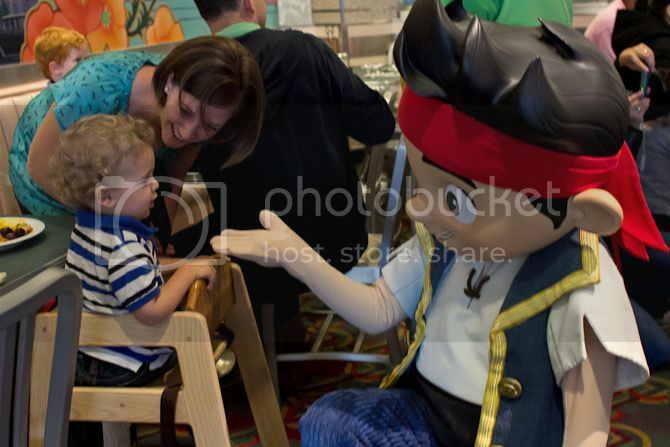 But even though they don't talk, they were completely engaging with the kids--high fiving, hugging, kissing, and asking Finley about his badges. Oh the badges. He got fussed over SO MUCH this day! Because this is one of the two parks that Russell makes appearances, everyone was more familiar with him and fawned all over Finley. It was precious. And you know what? FINLEY ALMOST FIGURED OUT SMILING. He certainly made somewhat pleasant faces in the direction of the camera, which is unheard of in these parts. 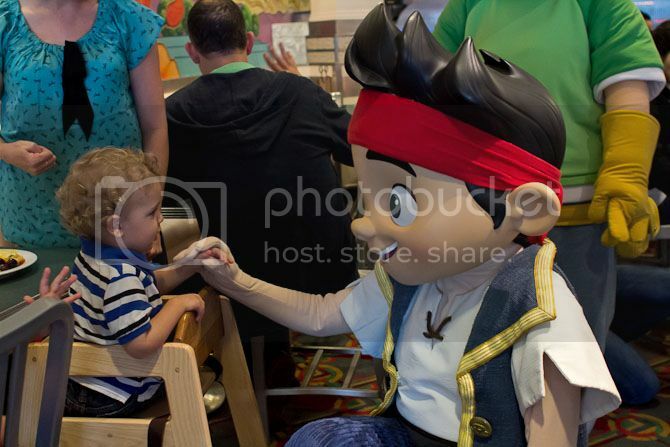 Braden really liked meeting the characters too. He recognized Jake and thought that was pretty cool. 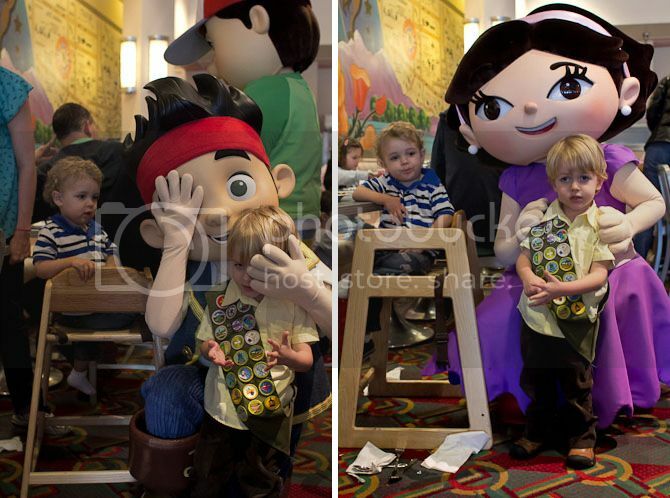 We don't really know who the girl in purple is--she's from Little Einsteins which we've only seen a few times. 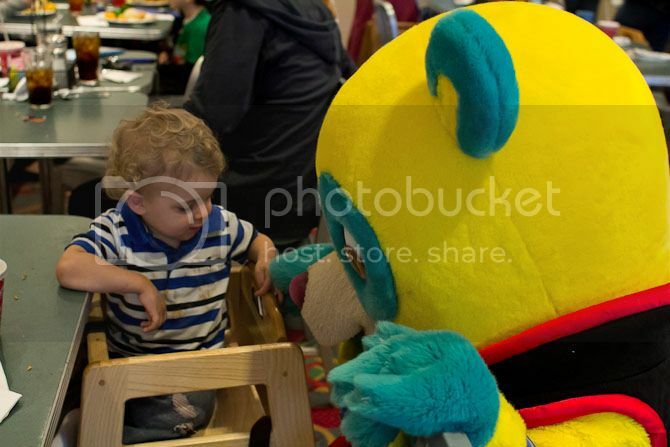 My favorite part was meeting Special Agent Oso. Why was that my favorite part? 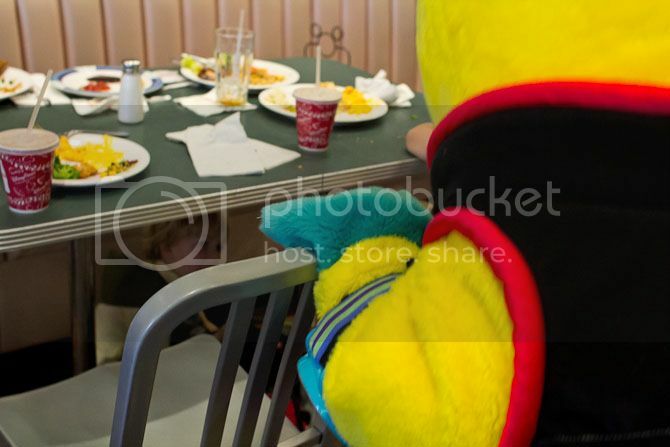 Because apparently Finley has an irrational fear of the big yellow bear, and hid under the table whenever he came remotely close. I have no idea why. Three years olds are irrational. 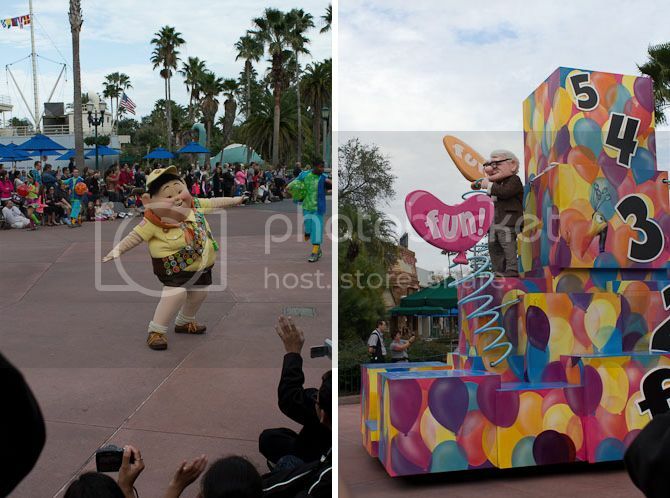 Next was the parade, which was a failure on three different levels. One, we didn't know which way the parade went and got there a little late, therefore were not in the front row and missed any chance of getting Russell's attention. Two, each movie had it's own little float. Now, if you were making a float about UP, what would you make? A large box with painted on balloons? NO! You'd make a house with balloons coming out of the chimney, dummy! Huge fail. Third, this was as close as we got to Russell. And he wasn't even wearing his freaking backpack. Impostor. 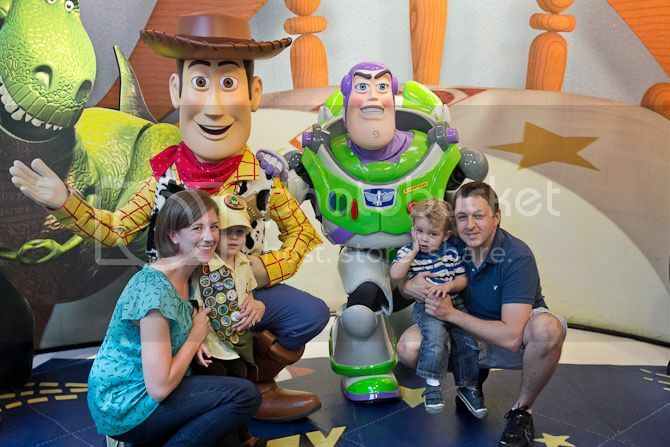 And then, waiting in line to see Buzz and Woody. 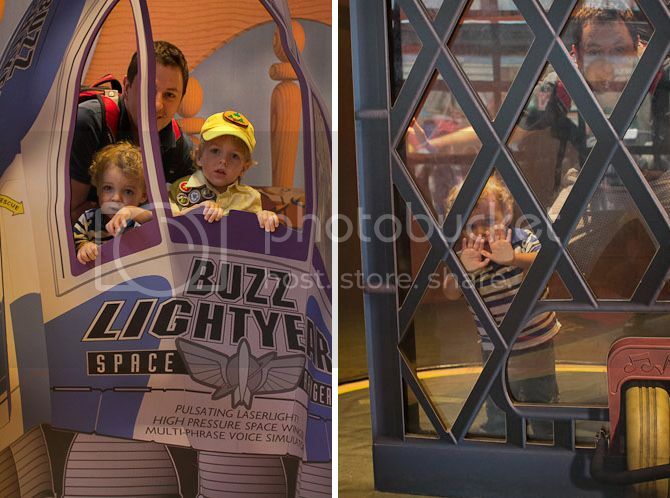 One of the great things about the newer Disney attractions is that they are designed to keep you entertained in line. 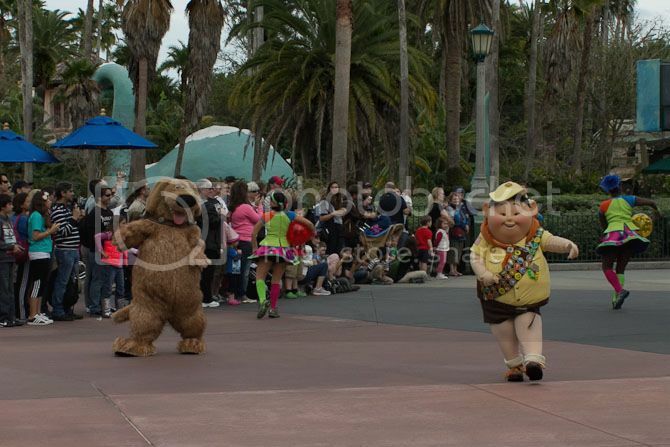 The whole distance you walked to meet the characters had little stops for you to stop and take pictures. Granted, the lighting was terrible, but it was still cute. 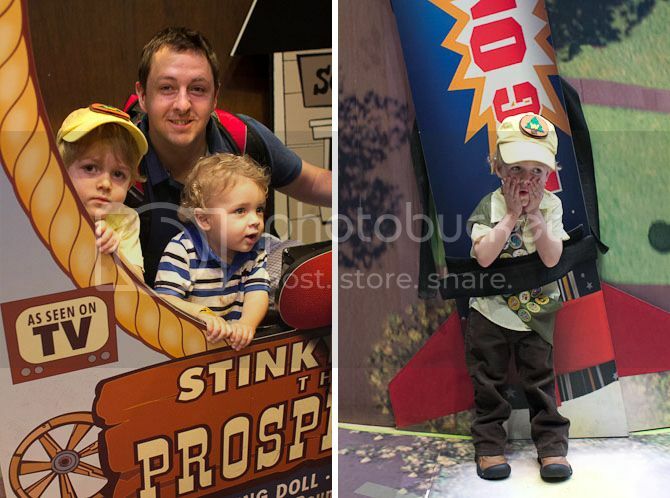 Look how scared Finley was to be strapped to the rocket!!! AHHH! And do you see who the one bozo not looking at the camera is? WOODY. 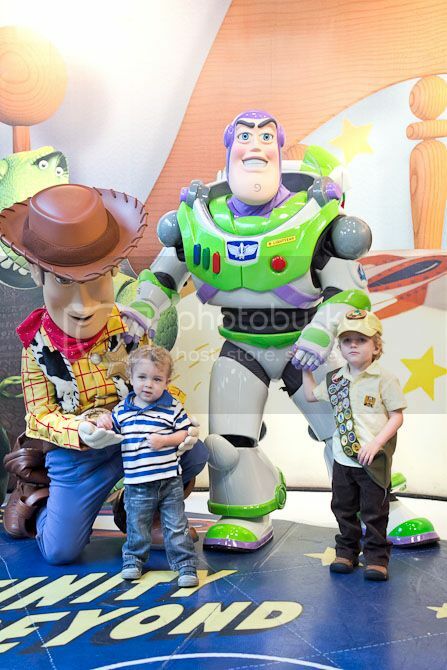 I was so proud of my boys--Braden for being brave enough to stand with someone who is not me, and Finley for holding still and looking kind of at the cameras with kind of a smile. Such big kids! 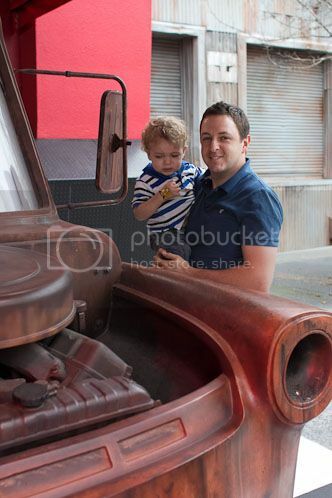 And then we "met" Lightning McQueen and Tow Mater. 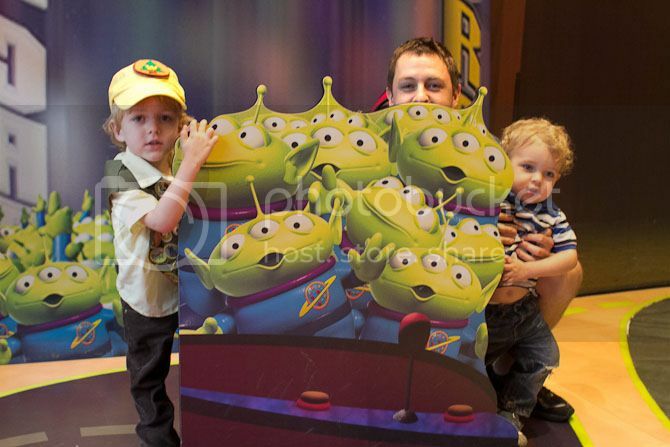 Braden was SO SO SO excited about them--until we got up close. When we got a little closer, you could hear them... which was pretty much loud engine noises. And he cried. So basically, day 4 was pictures with the boys' heroes. It was a great day. 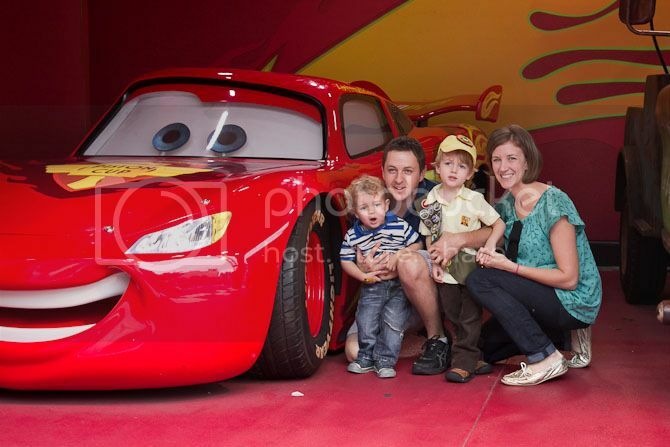 They also got to go to a Disney Jr. show with all their favorite characters that they LOVED. Finley refused to go to the Little Mermaid show (too scary) and had to leave Indiana Jones half way through (also too scary.) But it was still a really great day. 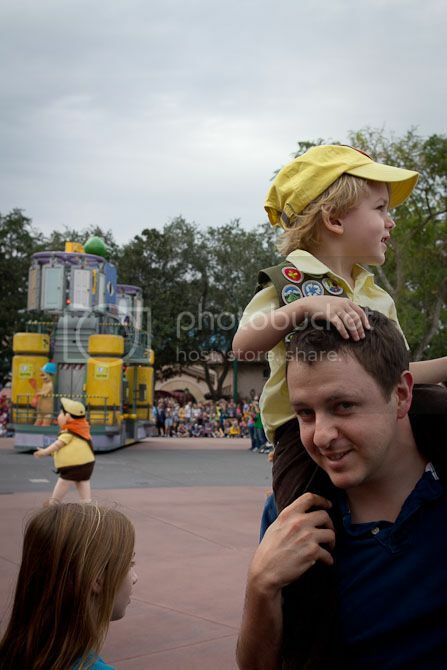 Because really, how could any day at Disney World NOT be a really great day? So so much to say. 1. Russell is CHUBBY (the "real" one) 2. 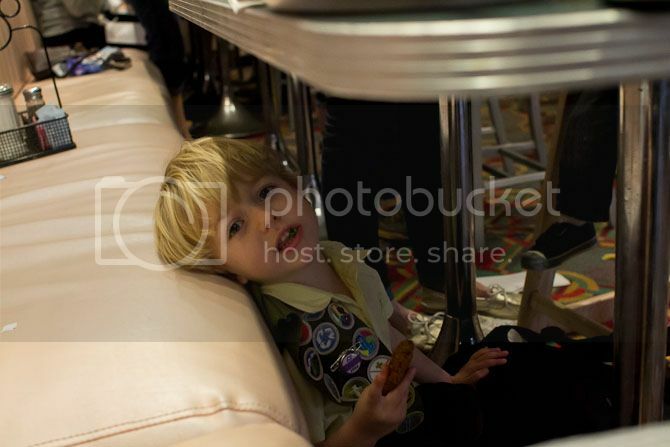 Finn hiding under the table cracks me up! 3. Of course Brady cried. Yeah, I feel like we could have done some serious damage if Finley was a chubby Asian kid. And surprisingly, they were Braden's only tears of the day! The Disney-Pixar Wilderness Explorers badging system engages youth in nature-based explorations, offering them a way to learn about and become advocates for wildlife and wild places. As these young Wilderness Explorers learn about conservation issues, they become teachers and ambassadors, content producers, and change makers. Badges will provide opportunities for Wilderness Explorers to make real connections in their communities that promote conservation locally and globally. That's amazing! Finley really doesn't understand what the badges are at all, but that sounds like such a cool project!